It's coming up on the third anniversary of this blog! I haven't been candy blogging nearly as long as many people, but after three years, it's nice to come across a candy bar that's completely unlike anything I've tried since I started this blog. Marks & Spencer is a department store chain in the United Kingdom. According to their website, they have locations in 40 countries, but the United States is not one of them. This candy bar is another kind gift from my boss, who is from the UK and sometimes brings candy back to the States with her when she visits. My boss told me that she thinks this bar is re-branded Thorntons chocolate, and this review at Chocoblog seems to back that up, but I couldn't find anything official. The amazing thing about this bar is that each of the segments has both toffee and caramel filling, separate but not divided so that they mix together a bit in the middle. 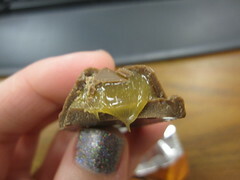 The toffee was very buttery and just a bit salty, and while those flavors were tasty, it was very, very sweet. The texture of the toffee was like lightly whipped mousse, soft, creamy, and thick. The caramel on the other hand was runny and smooth, and somehow even sweeter than the toffee mousse. The milk chocolate melted smoothly with a hint of stickiness, but it was still quite good. It had that milky richness that many British bars have. On the whole, this bar was a bit too sweet for me, but it was certainly unique. 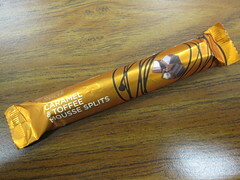 I preferred the buttery, salty flavor of the toffee mousse to the flatter caramel. Yummy this sounds so delicious, and quite easy to make. Thanks for sharing this recipe.